When the Blackhawks left on their annual Circus Trip, there were a number of questions most people had about the team. Were they deep enough? Would the goaltending be good enough? Would the superstars show up? The Hawks could not have written a more perfect beginning to their trip. Marty Turco earned his first shut out of the year, facing only 18 shots, and the big guns came to play as the Hawks dominated the Edmonton Oilers in every aspect of the game. 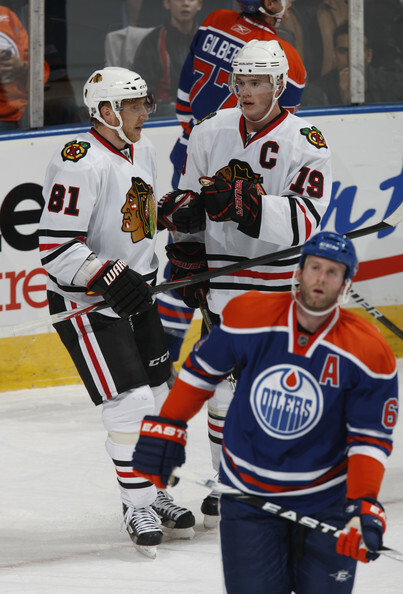 The Blackhawks owed the Oilers a beating after dropping two games in Chicago to the struggling youngsters. Speaking to the media after the game, Patrick Kane indicated that the Hawks were absolutely out for payback, and wanted to skate a full 60 minutes. But just winning the game wasn’t enough. If the Hawks were going to win, they needed to win big. And if they were going to win big, they needed to get a few things right in the process. Well, 5-0 is a pretty big margin of victory. And a number of issues that were lingering on the roster were successfully handled in the process. A couple Blackhawks were struggling to put the puck in the net lately, and both had a big night. It took only 21 minutes of game time for Jonathan Toews to tally a natural hat trick, getting the Blackhawks their first multi-goal lead of November with his second and putting the game to bed 72 seconds into the middle frame with his third. Patrick Sharp got off the schnide by scoring a goal for the first time in a couple weeks as well, a short-handed goal on a breakaway. The encouraging play from Toews, Sharp and the rest of the Hawks’ top two lines was evident early on. 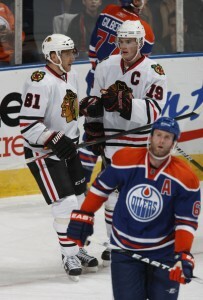 Toews, Sharp and Kane were the game’s three stars, with Toews’ three goals leading the way. Both Sharp and Kane had two-point nights. Duncan Keith has been skating heavy minutes all season, even with his apparent demotion off the top pair. The Blackhawks would certainly want to conserve the legs of their top four defensemen, especially Keith, if they want to have something left in the tank at the end of the trip. Keith led all Blackhawks in ice time again, but was only at 24:14 for the game. In fact, the minutes across the board were all well below season averages for the Blackhawks top four defensemen. Brent Seabrook only skated 19:42, Niklas Hjalmarsson just 16:53 and Brian Campbell logged 21:04 last night. Not only were the Blackhawks able to give heavier minutes to Nick Boynton and Jassen Cullimore, but both earned them. Cullimore was plus-two on the night with two blocked shots, and Boynton had three blocks. Dave Bolland also got himself right. To say Bolland has been struggling at the dot is like saying Ray Charles might be a bad driver; Bolland was winning under 40 percent of his faceoffs to start the year. He won 10 of 18 faceoffs last night, though. The other two players that needed to perform well to keep themselves out of coach Joel Quenneville’s doghouse on the trip were Bryan Bickell and Troy Brouwer. Bickell scored the fifth goal, a missile from the top of the circle, and Brouwer tied Viktor Stalberg for a team-high three hits in the game. Everyone showed up to play 60 minutes in Edmonton, and the Blackhawks served complete revenge on the Oilers. This year, the Blackhawks have shown flashes of having the talent to play with, and beat, anyone. Last night they played their most complete game of the year, their third with a completely healthy roster this year. It was the perfect start to a long road trip that could bring the Blackhawks back into the mix as a Cup contender. They are who we hoped they were!